Creamy, fruity, or filled with chocolate, one of these homemade pies will elicit smiles and raves from your family and friends. 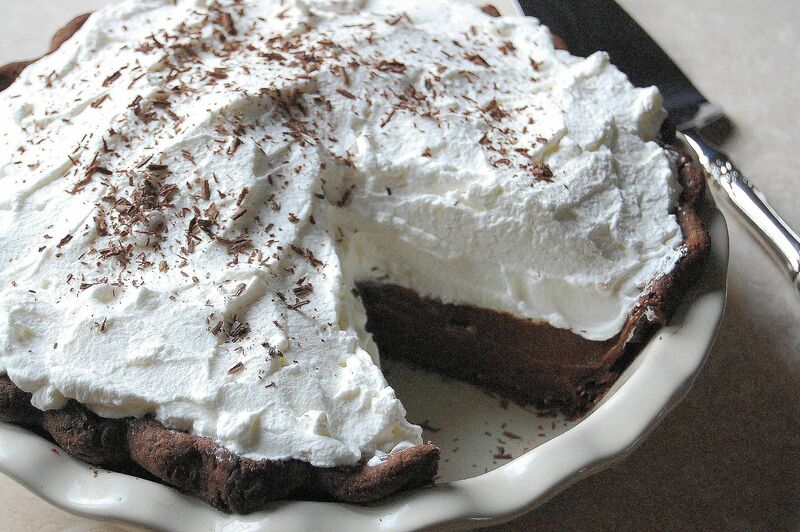 Who can resist the appeal of a homemade chocolate cream pie? Smooth, rich chocolate custard in a dark chocolate crust and topped with snowy mounds of whipped cream - it's simply irresistible! The recipe call for a chocolate pastry crust, which is simple to make and tastes delicious. But if time is short, you can always use a refrigerated ready-made pastry crust in its place. This two-layer lemon meringue pie is a year-round American favorite. Take one bite and you'll know why, the tangy lemon filling topped with billowing puffs of meringue is a heavenly combination. This pie is best served on the day it is made. This simple pie is perfect for a warm weather dessert because it's tart, creamy, not too sweet and very refreshing! Tiny Key limes ("key" as in the Florida Keys) are sometimes available in supermarkets and specialty stores, but you will have to squeeze an awful lot of the little devils to yield enough juice. You can also use fresh squeezed lime juice here instead. The sweetness of strawberries and the tartness of rhubarb are perfectly balanced in this delicious pie. It's best made in spring/early summer when rhubarb is abundant and strawberries are at their peak. Strawberry rhubarb pie is great served warm, but also very refreshing when served ice cold from the refrigerator. Nothing says summer more than a fresh blueberry pie. The cornmeal gives the crumb topping a slight crunch and whole-grain flavor. The topping may seem soggy when the pie is warm, but as it cools it becomes firm. One taste of this rich, dense chocolate walnut pie will send you back for more. It's traditionally served at the Kentucky Derby, but don't let that stop you for enjoying this decadent Double Chocolate-Walnut Pie all year long. If time is short, you can used a purchased pie crust for the pie. This sensational pie combines two favorite fall flavors—juicy, tart apples and buttery, rich caramel— for a sweet and salty dessert that will leave everyone asking for more. To make a good thing even better, serve it with some vanilla ice cream. This banana cream pie is amazing. The filling has a creamy, sweet flavor, and the whipped cream topping adds a sweet, fluffy counterpoint. Top with coconut to take this treat to the next level. This rich and delicious chocolate is a true Southern classic. This version is made with a little flour, along with unsweetened chocolate and eggs. Save time by using a frozen pie crust or pre-made pie dough. Can't wait for cherry season? Enjoy the rich flavor of cherry pie year round with this recipe that uses frozen, tart cherries. And, don't forget, the cherries in this pie recipe are packed with antioxidants, which makes this dessert almost guilt-free.